Game 47 of 82. Just another game, right? WRONG! All the players and coaches will say the same clichéd “this game is no different than the rest of them”. But they are lying to you. This game is very important for a myriad of reasons for both teams. The Oklahoma City Thunder are the hottest team in the league right now and the Miami Heat are the hottest team in the NBA this decade. The NBA always prides itself in pitting the best players (and their teams) against each other. Unfortunately, a rash of injuries have prevented that from happening consistently this season. But here is where the NBA finds itself a few weeks before the All-Star break. The Pacers and Trailblazers both have great underdog stories. The Spurs are like that old guy at the YMCA that consistently drains mid-range jumpers while sporting 2 knee braces and goggles. 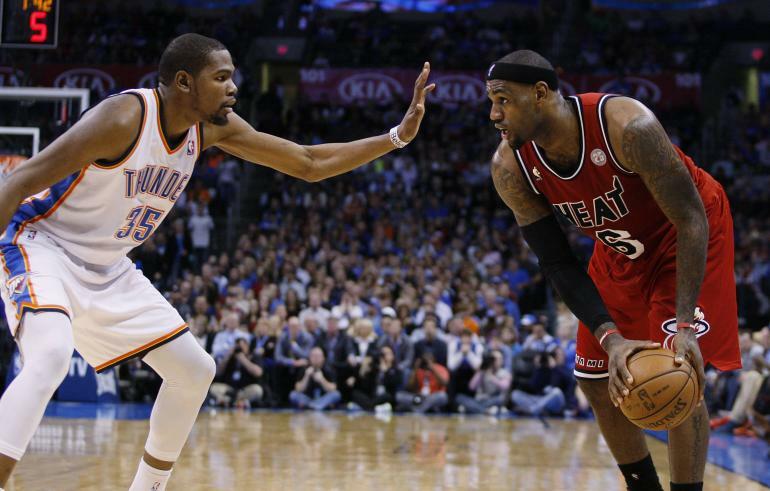 But the NBA knows what it wants…the two best players pitted against each other. Luckily, the two best players are also possibly on the two best teams and have a possibility of meeting in late May/early June (health permitting, of course). This is the first meeting of year between these two championship contenders. 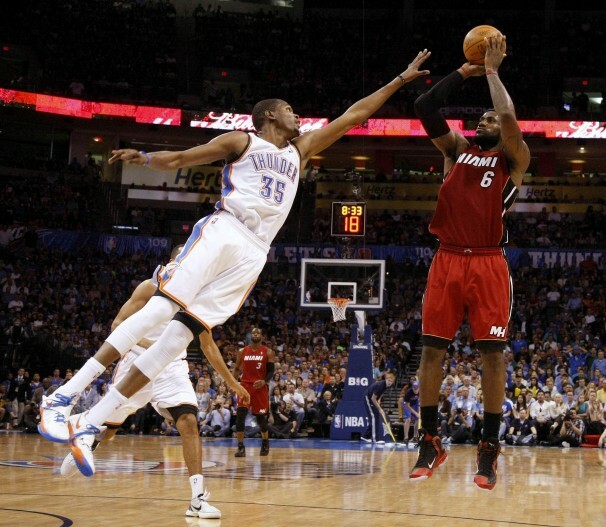 Dating back to Game 2 of the 2012 NBA Finals, the Thunder have lost 6 straight games to the Heat. Taking Game 5 of the Finals out of the equation, each game has come down to the final minutes of the 4th quarter. The two teams will meet again the Thursday after the All Star break. The Miami Heat find themselves at 32-12, two and a half games behind the Indiana Pacers for the top seed in the Eastern Conference. They, of course, are the winners of the last two NBA championship and feature the winner of the last 4 of 5 MVP awards, Lebron James. Many have said that the Heat are currently coasting and not necessarily playing their best ball. 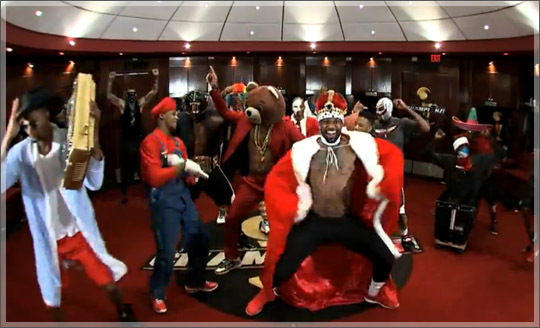 I honestly don’t blame Miami, though. They’ve played in the last 3 NBA Finals, so their extended schedule may feel like they’ve played 4 seaons in 3 years. Add to that the fact that the major players on the team also participated in the Olympics during that span, and you can see why they might be coasting a bit this season. Regardless of coasting, the Heat are still in the top 10 in points scored and points allowed. Their Achilles heel may be rebounding where they rank dead last in the league. The Heat are led by their big 3 of James, Chris Bosh, and Dwayne Wade. All three are performing at high levels with Wade having to implement a resting plan due to knee issues. Their offense depends greatly on dribble penetration and 3-point shooting. The Heat are in the top half of the league in made 3-pointers (8.1 makes/game), and make them at a high clip (37.4%, good for 7th in the league). James and Wade are usually the dribble penetrators who dish out to a bevy of shooters in Ray Allen, Shane Battier, and Mario Chalmers. The bench is veteran-laden and can be dangerous at times, with Norris Cole, Michael Beasley, and Chris Andersen providing the relief. 1. 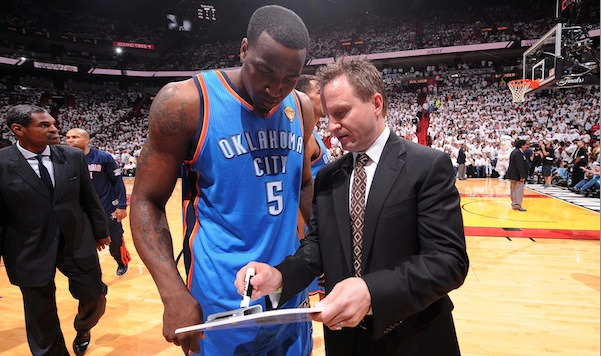 Scott Brooks – Will he adjust his line-up accordingly to combat Miami’s use of space or will he stubbornly stick with the line-up he’s always used? That will be the question heading into the game. I have no doubt that Brooks will adjust his line-up throughout the game after the first 6 minutes of the 1st quarter and the first 6 minutes of the 3rd quarter. But, the starting unit has had its issues with the Heat coming out of the gate. In the past six games against the Heat, the Thunder have yielded 31 points to the Heat in the time it takes from Perkins to be substituted out of the game. That’s an average of over 5 points that the team has to continuously claw their way back from early on. That’s takes a toll on a team heading into the final quarter. And let me reiterate…I’m not putting this on Perkins. He is great against traditional post players and that may come into play if the Heat begin to use Greg Oden more often. But putting Perk on Bosh is just a bad match up and causes the defense to over correct and compensate for defensive lapses leading to open threes and blown coverages. 2. Picking your poison defensively – The Heat are going to do one of two things: either drive the basketball or dish it out for a perimeter shot. James and Wade are great at getting into the lane and sucking in the defense. Once in the lane, their options open up like a Golden Corral buffet. They are extremely adept at finishing (even with contact) or they can pass it out to one of their 3-point shooter or to Bosh for the mid-range shot. The key is to try to stay in front of James. Kevin Durant is the best defender against James as his length bothers him, but that sometimes means that you are exposing KD to foul trouble. To combat this, the Thunder will shuffle defenders against Lebron, sending Sefolosha, Ibaka, or maybe even Perry Jones to guard James in order to ease the load on Durant. When the ball is kicked out, the Thunder need to hustle back to the 3-point line and use their long wingspans to their advantage. This is where it may be advantageous to have Jackson on the floor due to his wingspan. 3. MVP – Will the MVP race be decided today? Probably not. It is currently Durant’s to lose. But if James defeats Durant, the national narrative will probably begin to change in favor of James. The stats mean nothing if your team is constantly losing to the team the competitor is on. If Durant truly is tired of coming in 2nd, tonight will go a long way to changing that narrative. (Bonus) 4. Getting the gorilla off the Thunder’s back – Even though it doesn’t count until June, the Thunder need to exorcise some demons in regards to their futility against the Heat. Regardless of whether the Thunder are missing their second best player or not, they’ve been playing in a fashion that if they do lose this game, it will still be a disappointment. For the psyche of the team moving forward, they have to win one of these next two games against Miami.